Sound will still be a part of the experience. Harley-Davidson is closely following the automotive industry's shift towards electrification. 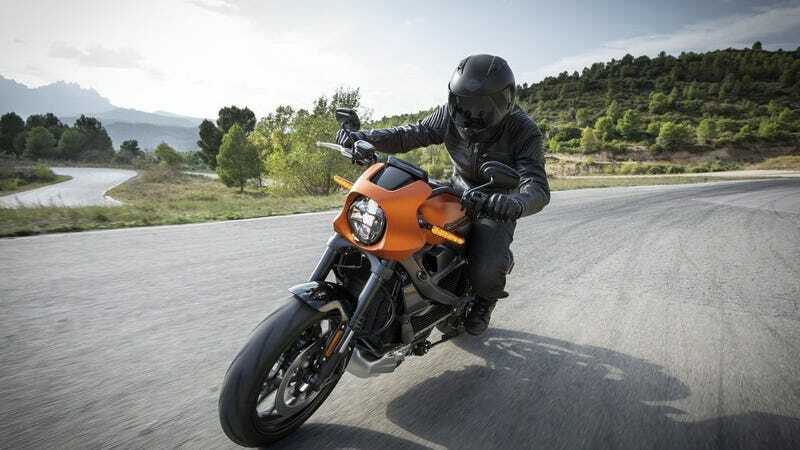 The Milwaukee-based brand has announced it is preparing to launch a range of electric motorcycles as part of an ambitious product offensive. "We actually showed a prototype of the electric Livewire [three years ago] and that project is alive and well. We don't know yet when we're going to introduce it, but it is progressing well and we will eventually introduce it," said executive Bill Davidson in an interview with Australian website Drive. The Livewire concept (pictured) previewed what a Hog looks like without a V-twin engine. Davidson didn't reveal whether the production model will resemble the concept, or if the company is taking its first battery-powered bike in a completely different direction. However, we imagine the powertrain will ultimately be offered on several different motorcycles, not just a single model. Purists will undoubtedly argue removing a Harley's vocal cords is sacrilege; the sound is part of the experience. The company agrees, but it won't settle for simply reproducing the V-twin's unique exhaust note. "We've actually created a unique sound through various technologies," Davidson explained. "We did not want a normal-sounding electric motorcycle. We wanted something that plays into that look and sound formula. It is something really cool. I often refer to it as sounding like a jet fighter," he added. Harley-Davidson isn't about to turn into the Tesla of the motorcycle world. The company will continue investing in and building gasoline-powered two-wheelers. In fact, its product plan calls for the launch of no less than 100 new models in the next decade. That thing looks sick! Hopefully they don't water it down much for production. Leaks are everywhere. MoCo may confirm or deny officially later today. Pretty neat idea, wonder how well it will do. What you’re looking at is a design validation vehicle, or DV in industry speak, which means it’s as close to a production model as there is of LiveWire. This one, however, didn’t roll off an assembly line. A lot of the finishing touches were done by hand and because of this, it also means we don’t get to ride it. Just yet.
. The bike sitting in front of us in Milwaukee today, is a significant evolution from what that early look machine was. LiveWire, as it sits today, is just one model, but as Harley-Davidson confirmed that it will be the launchpad for a new line of Harley electric bikes. Additional models which are slated to arrive in 2022. Harley is calling this their new “twist and go” portfolio of product designed to attract new riders with new ways to ride while establishing the company as a force to be reckoned with in the electric motorcycle industry. During a media panel, when questioned as to why the MoCo would build an electric bike, or if doing so dilutes the brand, Vice President of the Harley Davidson Museum and great-grandson of found William A. Davison, Bill Davidson responded explaining that LiveWire carries with it the company’s DNA where look, sound, and feel are central to any new product; “just wait till you ride it, it’s every bit a Harley-Davidson” he promised. Company executives even showed enthusiasm for the app-based shareable electric scooter trend that’s taking many cities by storm lately. “We love the idea of shared economy e-scooters; it introduces people to the idea of freedom. Harley-Davidson represents the premium end of the product,” was Vice President and Managing Director International Sales Markets, Marc McAllister’s quick take on the topic. The new all-electric LiveWire will be built in York, Pennsylvania, and comes to market in 2019. It will be available in three color variations for the US market: a gloss black, a matte yellow, and the Fused Orange seen in the photos here. 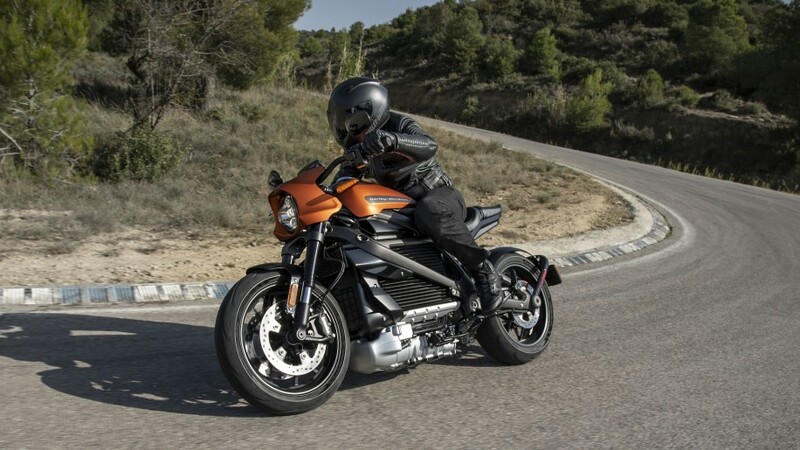 It's been no secret that the Harley-Davidson LiveWire was headed for production, but now we get to see the production version and get a sense of what its final spec will look like thanks to its debut at the EICMA show in Milan, Italy. It seems like Harley has a chance at making good on the promise it made to Autoblog back in January that the bike will be on the market within 18 months. The LiveWire has been in development for an eternity, it should be noted. The project that spawned it started in 2010. We rode one in 2014, a 74-horsepower prototype that made 52 lb-ft of torque and could hit 92 mph. It had a range of 60 miles, though. We assume the production bike will do better. But, we don't know, even with this EICMA announcement. We have details but not complete specs. Motor output, battery capacity, and range are all unknowns. That said, we can start filling in some gaps. It is still electric, of course, but we now know that it pushes power through a permanent-magnet motor. Like the prototype we rode, it makes a sound that increases in pitch with speed. Perhaps it's been refined, since the prototype just sounded like most other electric bikes out there. Sound characteristic is an important Harley feature, and we hope the new LiveWire sound is distinctive. The battery will be a multi-cell lithium-ion unit protected by a finned aluminum housing. It'll get juiced by an onboard Level 1 charger (the cord stores under the seat) or a Level 2/3 using the J1772 connector. Any Harley dealer that sells the LiveWire will (prudently) have a DC fast charging station on the premises. The production LiveWire will get Showa adjustable suspension: a monoshock in the back and SFF-BP front fork. The SFF-BP fork separates the spring from the damper, one in one tube and the other in another, for reduced friction and increased responsiveness. Braking is provided by Brembo Monoblock units, with dual 300mm discs up front and an unspecified rear system. ABS and traction control are standard, and it'll wear Michelin Scorcher tires (co-branded with Harley) at 180mm rear and 120mm front sections. It'll sport four predefined drive modes and three user configurable ones, too. As a high-tech centerpiece of the line, it'll feature a touchscreen display with lots of information available, including nav, Bluetooth, and vehicle functions. Harley says we'll have pricing and availability in January. Here's hoping we'll get more specs then, too. Harley-Davidson has been teasing its first electric motorcycle, the Livewire, since dinosaurs roamed the earth. We first rode it way back in 2014. It featured prominently in Avengers: Age of Ultron, but seemed as much a part of Marvel’s fantasy world as the superheroes themselves. Harley has been teasing us about the Livewire for at least five years now, showing it off from time to time but never giving us any more significant information about it, even at the 115th-anniversary opportunity. That ends today, however. Today’s news came not at a motorcycle show, but at CES 2019, which focuses more on electronics and technology. Vehicles have become a much bigger part of the show in recent years, though, as the line between them and high-tech gadgetry becomes more and more blurred. Not only was the Livewire there in all its glory, but Harley also showed off prototypes of an electric dirt bike and scooter, as well as a concept drawing for four potential models. We’ll write about these in another article. Finally, we get some official specifications of the Livewire’s performance. It’ll do 0 to 60 mph in 3.5 seconds. The range will be about 110 miles. It will charge off any standard household outlet at Level 1, as well as support Level 3 fast charging. H-D did not provide any charge times. But it did provide a price: $29,799. You can now look up a dealer that will be able to sell you the Livewire on H-D’s website. There’s still a great deal that we don’t know—the size of the battery or the power of the electric motor, for example. Harley’s always a little bit cagey about ratings like this anyway. The Zero SR is known to have a similar 120 mile mixed city/highway range with a 14.4-kilowatt-hour battery. The Livewire is probably a bit heavier than the SR, so we could be looking at a low to mid-teens kilowatt-hour battery. The range is not out of line with other comparable electric bikes, but certainly short of a typical Harley touring bike. You’ll be hard-pressed to finish your poker or toy runs on the Livewire. While performance specs are scarce, we do have lots of information about the H-D Connect Service, “an LTE-enabled Telematics Control Unit coupled with connectivity and cloud services using the latest version of the Harley-Davidson App.” The bike will be connected to the cloud. Owners can check the battery charge and expected range remotely, know where it is and if it’s been tampered with or moved, and automatically receive service reminders. Perhaps this is why the Livewire was revealed at an electronics show rather than a motorcycle show. Finally, since a giant part of the Harley experience is the sound, the Livewire promises “a new signature Harley-Davidson sound as it accelerates and gains speed. This new futuristic sound represents the smooth, electric power of the LiveWire motorcycle.” We don’t know if this will be the turbine whoosh of KITT from Knight Rider or a modernized version of the classic “potato-potato” sound. What we do know is that unlike other Harleys, adding loud pipes to the Livewire won’t help amplify the sound. When Harley unveiled the production-ready LiveWire electric bike at CES in early January, we were all focused on the Wisconsin brand’s pricing strategy. With an MSRP of $29,799, and a whole lot of estimates, question marks, and TBAs when it came to the bike’s ultimate performance, we were forced to assume the worst. As it turns out, things are a bit better than we may have believed in January, but the bike is still hellaciously expensive. According to Harley, it has finally performance tested and certified the LiveWire in production trim. The 0-60mph time was previously expected to be 3.5 seconds, but that’s been beat by a massive half-second, sitting at 3.0 now. The 60-80mph time is even more impressive at just 1.9 seconds. According to Cycle World, that’s way quicker than anything non-electric, including the legendary Suzuki Hayabusa and Triumph’s Rocket III. Acceleration was always going to be the LiveWire’s strong suit. It was expected to fall short on range. While Harley still won’t say what size its battery stack is, it appears to be just a smidge smaller than that found in the new Zero SR/F. While the Zero manages 82 miles of 70-mph riding, the Harley falls short of that. It doesn’t quote a full highway number, but somewhat misleadingly slaps an 88 mile number on a “combined” city and highway. 140 miles of city range for the LiveWire isn’t too bad, however. So, the Harley is really quick. It’s not quite as quick as Kawasaki’s supercharged H2, despite costing about the same money. For now, the fastest of gasoline motorcycles still outpace Harley’s electric, but it’s closer than we thought. I’m starting to come around on the price of the LiveWire, but it’s still pretty expensive. Give it a few years and inexpensive electric bikes will start coming down the pike. For now, we have to rely on people to buy into the more expensive models, like the Livewire, to push companies to focus on making more of them. I’m ready for it.